Photographed from a Navy aircraft, Socony-Vacuum Oil tanker Steamship Dixie Arrow, her back broken by three torpedoes, burns furiously as her cargo of 96,000 barrels of crude oil caught fire on the morning of March 26, 1942. 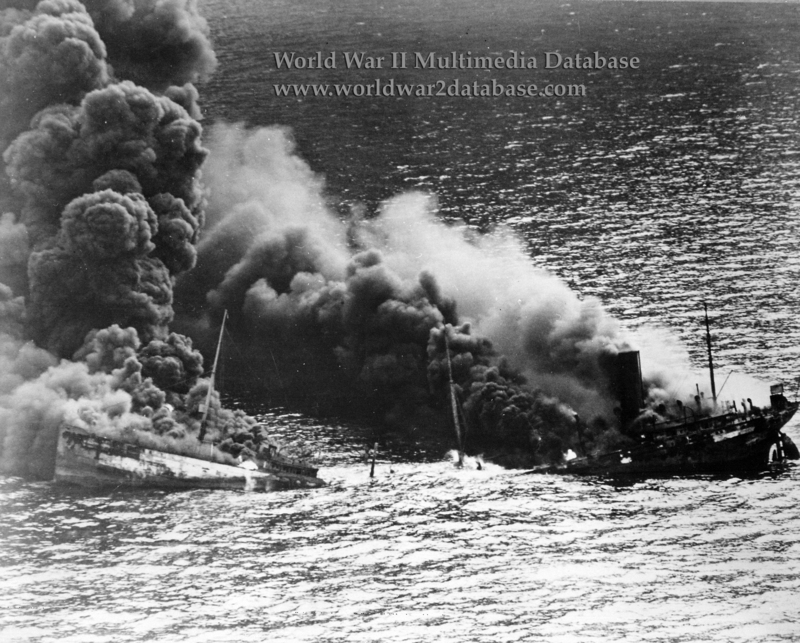 When Reichsklanzler (Reichchancellor) Adolf Hitler declared war on the United States on December 11, 1941, the only offensive weapon was Grossadmiral Karl Donitz's U-Boats. Donitz directed five subs to the East coast of the United States that month and they arrived in January 1942. Named Operation Paukenschlag ("Drumbeat") these five Type IX U-Boats, and an additional sixteen others enroute, covered American ports from Maine to the Caribbean. They immediately scored tremendous successes; they particularly focused on oil tankers, which brought ninety-five percent of the American Northeast's oil from the Gulf of Mexico. United States Navy Admiral Ernest J. King refused to recognize the crisis or to implement convoys as the British recommended. Within six months, 609 ships were lost and over 5,000 crewmen and passengers had been killed. U-71, under Kapitanleutnant (later Korvettenkapitan) Walter Flaschenberg (October 26, 1908- November 3, 1994) was part of the second wave of U-Boats sent to the American coast. After the success of the first wave, Flaschenberg doubted the Americans would continue to send tankers on unescorted runs through Cape Hatteras, Noth Carolina. U-71 waited off Diamond Shoals. She had already sunk the freighters SS Ranja (Norway) and SS Oakmar (United States). Flaschenberg doubted he would have the honor of presenting Donitz with a tanker kill, but early in the morning of March 26, the SS Dixie Arrow came into view at 0730 Hours. She had left Texas City bound for Baltimore a few days before under the command of Captain Anders M. Johanson (1889 - March 26, 1942). Johanson attempted to ascertain the safety of Cape Hatteras from United States Navy vessels he encountered en route, but he could not verify reports of mines and U-Boats. So, he followed his company's orders and sailed through Diamond Shoals with Able Seaman Oscar G. Chappel (???? - March 26, 1942) at the wheel. Flaschenberg fired a spread of torpedoes and obtained three hits at 0959. Chappel saw the incoming fire and called out, but was too late to avoid the strikes. The first torpedo struck under the pilothouse amidships, and the second broke the back of the Dixie Arrow. The crude oil spilled out of the tanks and caught fire. Seeing the crew gathering on the bow, Chappel turned the ship into the wind, saving the men but ensuring his own death as the flames now engulfed the pilothouse. Captain Johanson emerged from his quarters in full uniform, just in time to be blown up by a third hit. The men launched lifeboats and rafts, but the ship was now drifting and the burning oil sucked all but one boat and one raft into the fire. Some of the crew dived into the water to avoid the flames, but some refused to leave the boats and were burned to death. A total of eleven men died in the conflagration, including Captain Johanson and Seaman Chappell. Twenty-two survivors watched as newly arrived destroyer USS Tarbell (DD-142) dropped depth charges on U-71, knocking some survivors into unconsciousness. Now aware of the men in the water, Tarbell rescued them and took them to Morehead City, North Carolina. Dixie Arrow sank two hours later. U-71 sank five ships during this patrol and returned to La Pallice, France on April 20. Flaschenberg was promoted to Korvettenkapitan on July 1, 1942. U-71 made further patrols through 1945, but never again sank an Allied ship; she was scuttled in Wilhelmshaven on May 2, 1945. The United States began convoy operations in May 1942, and her shipyards produced escorts in large numbers by 1944. But the first U-Boat sunk by the United States Navy, U-656, wasn't until March 1, 1942, and the first sinking by a surface ship wasn't until April 14, when USS Roper (DD-147) sank the U-85. The American Northeast experienced an oil shortage until late 1943 because of all the tankers sunk in early 1942.